It's time for Mutant of the Week! This week's mutant, a creature born of quiet genius, comes to us from the Quantum Duck Mutants created by Jesse Garson of EYE iN tHE hAT productions. You can view the silently expanding army of Quantum Duck mutants here. Tell a friend, and remember...a pitcure is worth a thousand words! Visit Jesse's Mutant of the Week store here. Anybody else have an urge to play charades? I want the ant on my team; I just know he'll win every round. Or we can watch a silent movie. 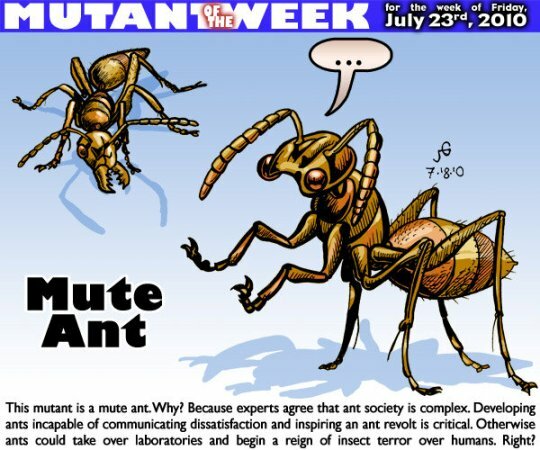 You choose, mute ant. What's that? Speak up, I didn't hear you.